I am very lucky that my local Lush store is kind enough to put on blogger events, which are always fun and informative to go along too ^_^ When I was invited to one last week, the words ‘Oxford Street exclusives’ immediately caught my eye...for those of you who don’t know, the Oxford St. Lush store is FOUR floors high, so you can imagine that it’s packed full of exclusives that you can’t find elsewhere! My local Lush was adding some permanent goodies from that store and of course I was delighted to attend. Please excuse my photography though, it was right after work and I didn’t have time to get my camera, so my iPhone will have to do for this post. The last event at Easter time only had 10 of us bloggers, so it was a huge surprise to see around 30 people waiting outside! We started with a little ice-breaker by throwing around one of the shower jellies and telling the others our name, blog/YouTube and what we blog about. Then we were split into three groups and shown around three sections ‘scrubs, shower and bath’ I think. It was a relief to see a familiar face from the last event - Tasha (who blogs over on:http://www.tashameline.com/ check it out!) and we loved the demos and trying out all the products. My sense of smell has half returned thankfully, so I actually found it productive having a whiff of everything but by the end I left smelling like I had rolled in half the store haha. In the first mini tour the thing that stood out to me the most was the Cup of Coffee Scrub which instantly reminded me of the Frankbody scrub (reviewed here). It smelt good and felt better, with a heck of a lot less mess because the scrub is already mixed rather than a dry scrub. One of the lovely Lush assistants put the scrub on my hand and when she washed it off I love how it gently exfoliated my skin and left it feeling super soft! I’ll be continuing to try my sample out for that as it’s on my potential purchases list for sure. Another product which really impressed me was a new moisturiser/primer for oily skinned people called Magical Moringa. Packed with rose hip oil, argan oil and moringa all mixed together into a balm type of moisturiser, it felt sooo lovely on my hand, yet sure enough it dried to a matte finish without any dryness as all. That area on my hand was literally matte but moisturised and if they sold it in smaller tubs I would definitely pick one up - as my skin isn’t really oily, it’s more normal I couldn’t really justify it but I would highly recommend you ladies with oily skin to check it out next time you’re there. The Golden handshake caught my eye straight away - look how adorable it is! It’s such a unique concept too, a ‘hot hand mask’ it is made of argan and avocado oil which really nourishes the hands and makes them feel super soft. It was one of my favourites and I had to pick one up, I’ll probably whip it out when my dad gets home from his trip and give my family a mini pamper ^_^. 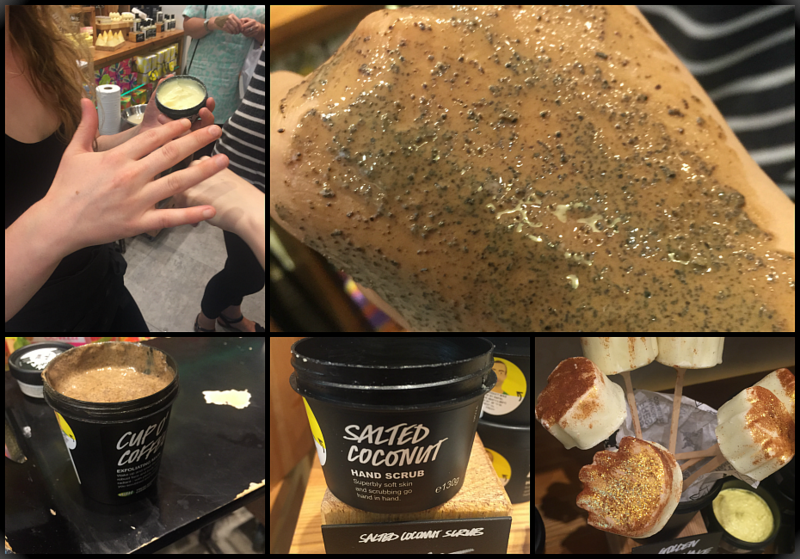 The salted coconut had scrub is another great product which smelt divine! If you like the smell of coconuts, you’ll love this, especially when you’re scrubbing it onto the skin - we couldn’t stop smelling the air! 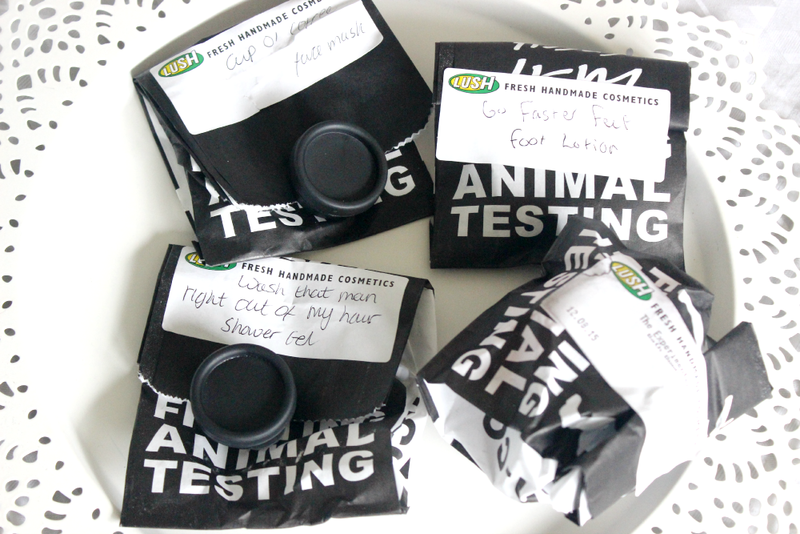 Lush also have a range of new feet loving scrubs, soaks and moisturisers. One of the bloggers volunteered to have a foot bath and I’m sure her foot was super soft - the range is really impressive and one I’ll be checking out after our trip to the Lake district where there is a LOT of walking planned! 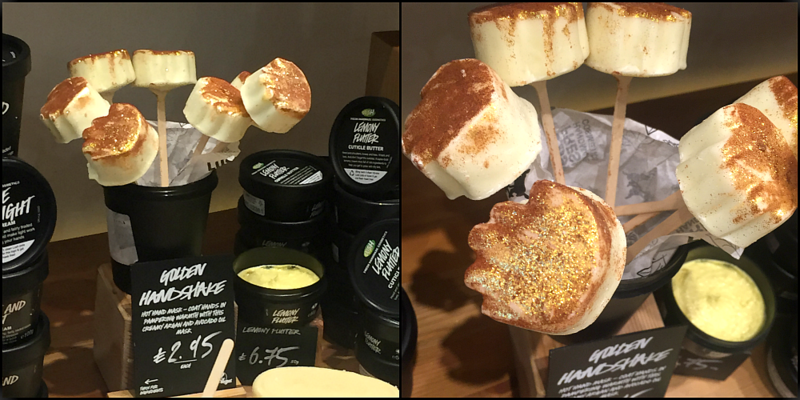 The lush shower section is always fun, seeing the different scents they’ve bottled and combined with nourishing oils and butters to soften and pamper the skin. I couldn’t wait to demo their shower jellies because I was always curious if they would feel slimy y’know?! It was pretty slippy but once she started rubbing it onto my skin, it felt so soft and creamy! The one I tried the whoosh one which is ‘named after the sound of deadlines whizzing by harharhar. It comes from seaweed meaning its gelatine free ad vegetarian friendly! It left my skin feeling soft and silky which I really did not expect at all. 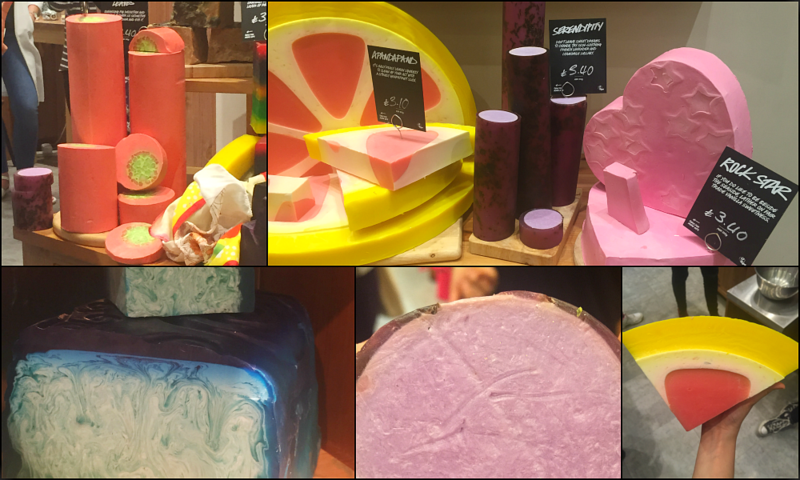 Lush always come out with the coolest looking soaps, they showed us the layer cake the apandapand and the outback mate which has to be one of the most beautiful things in store! We all agreed that it would make a gorgeous decoration piece as well as a soap for any bathroom - just look at those shades of blue! Mine and Tasha’s favourite soap of the bunch was the lavender one (Serendipity). It smelt so soothing and is basically perfection to use before bed, plus the bits of lavender inside looked so pretty too. 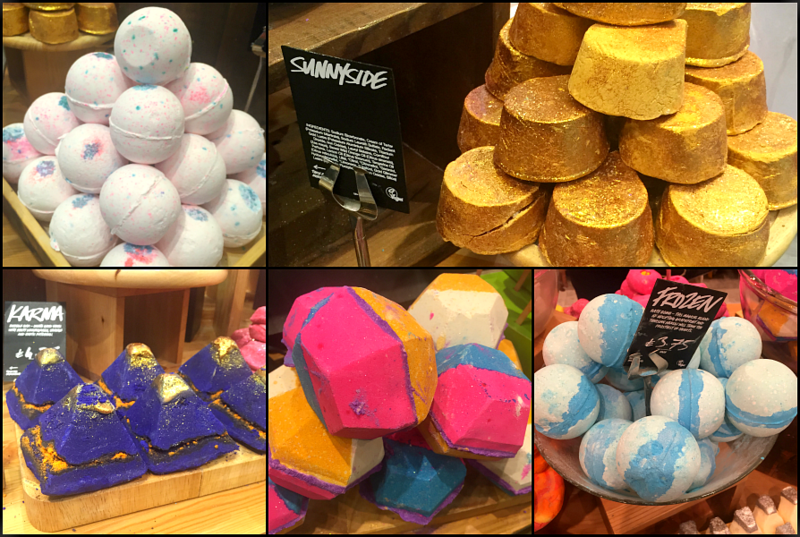 Fnally we moved onto the most fun and indulgent section of the store - the bath bombs! There were quite a few new additions since I had last been instore and the demo of ‘Intergalactic’ (pictured above!) was probably the highlight of the evening for me. Just look at that beauty!! It was honestly like watching a live art demonstration, I was in awe, the colours swirling together with the gold laced through it - they really out did themselves with this! 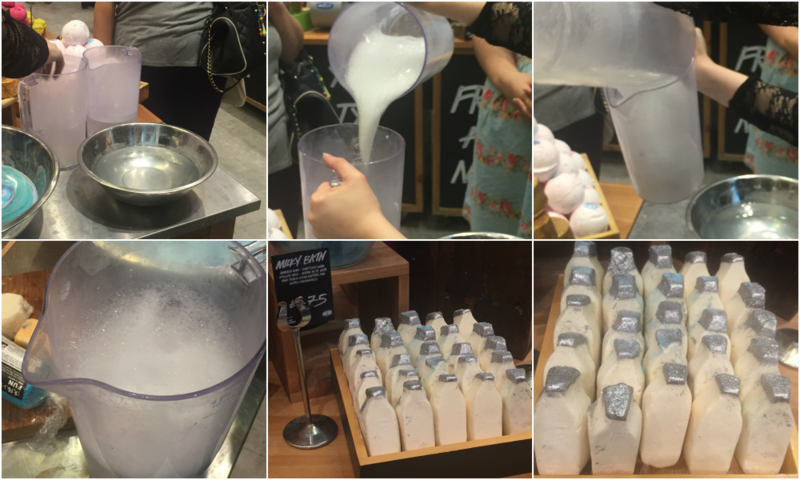 I also loved the Milky Baths which are the most adorable little bubble bar shaped like milk bottles with silver glitter at the top. The inspiration behind these was the well known Cleopatra tale, of how she used to bathe in milk! These aren’t made of milk of course, rather packed with fair trade cocoa butter and the demo of this felt sooo heavenly! The water was incredible soft and my hand reluctantly left it feeling rather pampered, so of course I had to buy one myself too haha. Lush are always kind enough to give us a goody bag, this time I was sure they wouldn’t have one because of the sheer amount of people who turned up! But we still got a bag which was so kind of them! 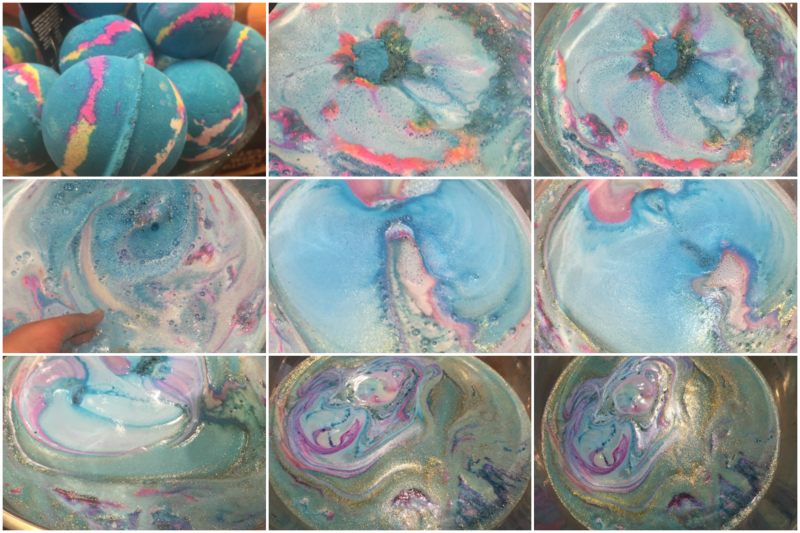 In mine was the Experimenter bath bomb* a very colourful, funky looking shape as well as three samples. The ‘wash that man right out of my hair shower gel’ sample which has the strangest name I’ve ever heard! The ‘Cup of coffee face mask’ which I talked about earlier was also included and finally the ‘Go faster feet’ foot lotion which I’m really excited to try. The two items I bought were the Golden Handshake and the Milky Bath bubble bar. A big thankyou again to Lush - I really appreciated being invited to come along, the staff are just as lovely as everything inside! 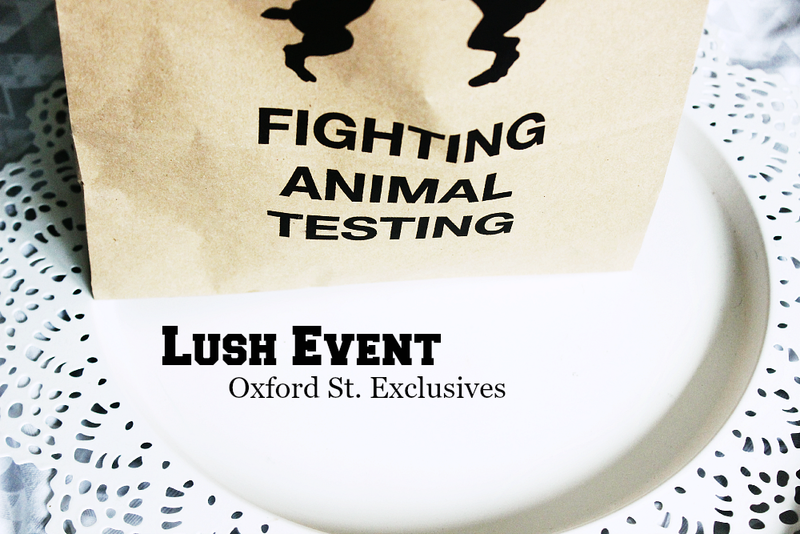 Have you visited the Lush store on Oxford St?